Development of Real-Time PCR for in wood-detection of Ceratocystis platani, the agent of canker stain of Platanus spp. Ceratocystis platani is a quarantine fungal pathogen agent of canker stain, a destructive disease affecting Platanus. Despite its diagnosis being critical for disease control, there is still no effective diagnostic tool as all known mycological and biological detection assays are problematical. In this study we developed highly effective Real-Time PCR methods based on the use of an intercalating dye, EvaGreen, and on a Taqman probe. We designed primers and probe on the internal transcribed spacer (ITS) region of rDNA, and used them for the amplification and detection of a 95 bp C. platani amplicon. Inference of standard curves revealed that both Real-Time procedures have similar and high values of amplification efficiency when applied to a range of templates, e.g. genomic fungal DNA and DNA extracted from diseased wood. The methods were sensitive with a detection limit of 10 fg μl−1 C. platani genomic DNA. They were specific as they did not yield any detection signal when applied to non-target fungal taxa colonizers of Platanus wood. Reliability was demonstrated through the positive detection of a collection of C. platani isolates and of wood samples collected from naturally infected trees. Robustness was positively verified through detection on artificially infected trees, which were tested at different times after death, up to 27 months. Generating a standard curve with a target-amplicon-containing plasmid enabled an absolute quantification and a comparison between the discoloured wood of resistant and susceptible genotypes. The importance of the methods for studies on pathogen epidemiology and host resistance is also discussed. The online version of this article (doi: 10.1007/s10658-012-0022-5) contains supplementary material, which is available to authorized users. 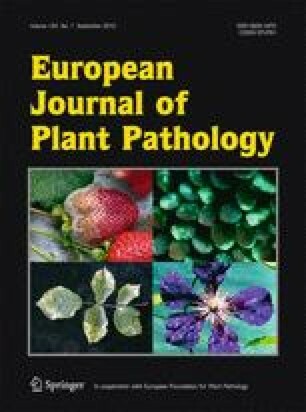 This research was supported by a MIPAAF (the Italian Ministry of Agricultural and Forestry Policies) project: “Armonizzazione della diagnosi e valutazione del rischio di patogeni da quarantena e nocivi ai vegetali e ai prodotti vegetali - Definizione di protocolli di diagnosi di funghi patogeni (ARON/ARNADIA)”. We would like to thank all the creators of the public sequence data of Ceratocystis platani and Ceratocystis spp., which were key for the design of our method. Thanks also to Prof. Paolo Capretti (University of Florence) and Dr. Tiziana Baschieri (Phythosanitary Service of Emilia-Romagna region) for providing Ceratocystis platani isolates.